Some patients may choose to restore their missing teeth with dentures. Dentures are removable prosthetic teeth. A partial denture replaces a few missing teeth while a complete denture replaces all missing teeth in either the upper or lower jaw. When teeth are lost then some of the supporting bone shrinks away too. This can cause the facial muscles to sag and your face to change. It can compromise your chewing function. Dentures can replace the missing teeth and add support for your facial structures. 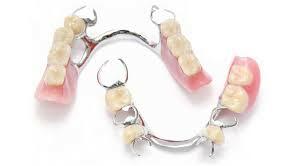 Our office can make many different types of dentures depending on what suits you best. There are acrylic dentures, dentures with a metal framework, flexible dentures, dentures attached to teeth and dentures attached to dental implants. Poway dentist Dr. Joe N.T. Nguyen takes many measurements to make sure the position of teeth, height, size and bite are correct for your new dentures. Impressions are taken of your mouth to create plaster models. A bite registration is taken so we know how to orient the upper and lower models to match your bite. Photos are taken to help the lab decide what shape and length of teeth to use. A shade is selected to determine the tooth color. The denture teeth are added with modeling wax to a custom base so we can try and preview the teeth in your mouth. At this point Dr. Joe can arrange the teeth setup to make it look natural. Some people want their teeth perfectly straight while some people want them slightly off to make them look more natural. Dr.Joe will verify that the bite is even. We will try have you pronounce certain words and sounds to make sure your speech is not changed. If the denture teeth are too long, too short, too far forward or back then certain words may be difficult to pronounce. If the preview looks and feels great then the models go back to lab where they will process the final denture. The completed denture is tried in your mouth and adjustments are made to fine tune the details. This time you get to take the dentures home. 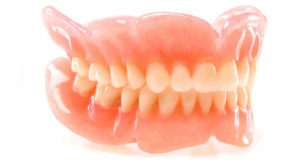 A new set of dentures may take a little time to get used to as the tissues will adapt and the dentures will settle in. Your lips and tongue will also adjust to the new position of the teeth. We allow 3 additional visits for adjustments. Sometimes after wearing your new dentures for a time, you will discover minor denture sores where you may need adjustments. Dr. Joe wants to make sure you are completely happy with your dentures because he wants you to be comfortable and show off your smile.